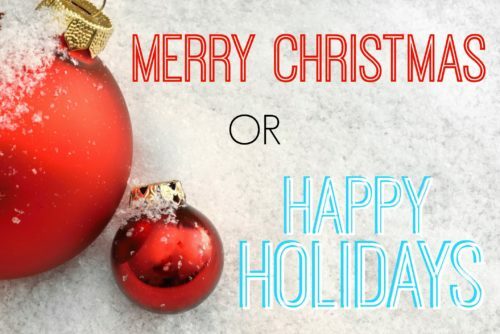 Do you say "happy holidays" or "Merry Christmas"? This year we can see the divide between both religious and political party lines. Incoming president Donald Trump in his “Merry Christmas USA Thank You Tour” decorated his stages with Christmas trees. In upholding Fox News Channel motto of “fair and balanced” news Bill O’Reilly on his show stated that the “war on Christmas” was won by the good guys, but a few insurgents remain. One of the few insurgents is outgoing President Obama. Acknowledging there are a few other holidays this time of year – Hanukkah, Kwanzaa, Yule, Saturnalia, Festivus and Ramadan – Obama for eight years has embraced an all-inclusive seasonal greeting emblematic of our nation’s diverse religious and cultural landscape with two simple words — Happy Holidays! Is there really a war on Christmas, some ask? According to the recent Public Policy Polling (PPP), if you say “Merry Christmas” you insult a liberal and if you say “Happy Holidays” you vex a conservative. PPP revealed that 57% of Republicans believe there’s an ongoing war on Christmas. However, while 9% of Americans welcome a non-denominational holiday greeting, 45% prefer the traditional Christian greeting, and 46% revealed they could care less. Some see the war on Christmas as an assault on Christianity, where the mere utterance of the word is gradually being expunged from the holiday public lexicon. And it feels to these Christian holiday revelers, as if the country, in its effort to be political correct, is moving toward religious intolerance. But for Christmas apologists they refuse to see anything else because the war on Christmas is about maintaining their centuries-long cultural dominance. Trump has taken Robertson’s Islamophobia to a fascist level in his public diatribes where he once stated that our government should ban all Muslims from coming to the U.S. (even American Muslims returning home from overseas) and now nods to the suggestion of a Muslim registry. Truth be told, Muslims, secular progressives, and Jews, atheists have never been the folks trying to abolish Christmas. Instead, it was once an extreme group of Protestants – yes, the Puritans. With the date of December 25 deriving from the Saturnalia, the Roman heathen’s wintertime celebration, and with the date found nowhere in the Bible stating it as the birthday of Jesus, the Puritan Parliament banned Christmas from 1659 until 1681. The intolerance of a multicultural theme for this holiday has little to do with a heightened renewal of the birth of Christ or the fading of a downtrodden American holiday. Instead, it has much to do about a backlash toward a country growing more religiously pluralistic. As a Christian, I know that the central message of this holiday is the embrace and celebration of human differences and diversity. And it is with this message that I know all people — religious and nonreligious, straight and queer, black and white — can be included to enjoy and to celebrate and to acknowledge this season with one simple greeting.